She wasn't about to give up her art. The couple separated in 1931 (they wouldn’t divorce until 1941). 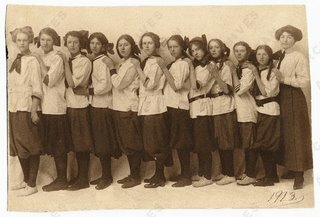 She briefly returned to Maine with her son Mike (Myron), then about 9, regrouped, and then left her boy with her mom and lit out for Europe and studied with Hans Hoffman in Munich. By 1932, she was back in New York (without her son), and studying art. One of the earliest pieces here is her cubist “Self-Portrait” sculpture from around 1940, a jagged black bronze woman, about a foot tall, with a tiny head, and chunky arms and legs, on an ebony base. “Moving-Static-Moving Figures” (c. 1945) is series of stacked blocks incised with abstracted faces and breasts in a style reminiscent of Miro, who, after Picasso, was perhaps the primary influence on the budding New York School then. The guy sculptors welded metal; she chose wood as her medium. Her assemblages of the ‘40s and early ‘50s, pieces like “Ancient City” (1945) and “Night Presence VI” (1955), are built from found wood bits that retain much of their original identities as furniture legs, red-winged wood griffins, door knobs and hoops. By the mid 1950s, the heterogeneous parts become integrated into harmonious wholes, unified by painting everything one color, usually black. And her forms feel more organic, a bit like Isamu Noguchi’s sculptures. “Chief” (1955) is a black board with smooth curves, like a person’s back, and a jagged fringe of wood spikes. The title clearly comes from the sculpture's suggestion of a Native American headdress. “First Personage” (1956), a terrific piece, is energized by the contrast between two freestanding sections. In front is a tall smooth generally flat plank of wood, which curves out about halfway up the sides and narrows at the top, like an abstract silhouette of a person. Behind is a tower of horizontal wood spikes, which suggest both a spine and a porcupine. The contrast between the smooth and the sharp is elemental, and breathtaking. And then – wow – “Sky Cathedral Presence” (1951-‘64). It feels like the gates of night. It’s a wall (pictured at left) constructed of various boxes, crates, chair legs, balusters, jagged planks, and broken things with an itchy familiarity but that you can’t quite place. The boxes on the sides are relatively shallow, but they get deeper in the center. You eyes explore the recesses, which feel deep and mysterious because of their blackness and shadows. It radiates the solemness of a shrine or temple. It’s followed by the surprise of her all white(!) installation “Dawn’s Wedding Feast” (1959), which was included in 1959’s “Sixteen Americans” at New York’s Museum of Modern Art with works by the then young whippersnappers Jasper Johns, Robert Rauschenberg and Frank Stella. She was already 60. It apparently references her failed marriage of 30 years before. The installation includes assemblage walls, standing and hanging columns, and totemic figures, that disappointingly literally represent a wedding party. The white gives the piece a sense of calm. It avoids the mysteriousness of her preceding works, mostly because the lightness allows you to see all the bits and pieces, all the way to the backs of the boxes. After this, though, Nevelson begins to repeat herself. Part of the problem is she moves away from her improvisational compositions with idiosyncratic found forms, and adopts a more regular geometry, which mostly feels generic. Her Holocaust memorial “Homage to the 6,000,000 I” (1964) is two walls of boxes in a uniform grid stuffed with balusters, guitar backs and who knows what. It suggests, maybe, the things the dead had carried or a storehouse of luggage, homes, memories lost. But the forms feel repetitious and dull. Instead of being drawn to explore all the nooks and crannies, it feels like if you’ve glanced around a little, you’ve seen it all. “Mrs. N’s Palace” (1964-’77) is a square wood hut with a black mirrored floor. It feels like an old garage workshop (with rebar ferns out back) combined with a funeral vault. The ceiling and walls are dense with objects, but the room itself is mostly empty save for three totem-figures. Nevelson seems to have lost her spark. Instead of being surprising, intriguing, mysterious, the installation feels like she’s trying too hard to be different. It feels forced. A couple gold-painted cubbyhole walls from the ‘60s just feel tacky. And her tack toward geometric repetitiousness reaches its boring nadir with two small sculptures of clear plastic or Plexiglas cubes from 1967 and ’68. 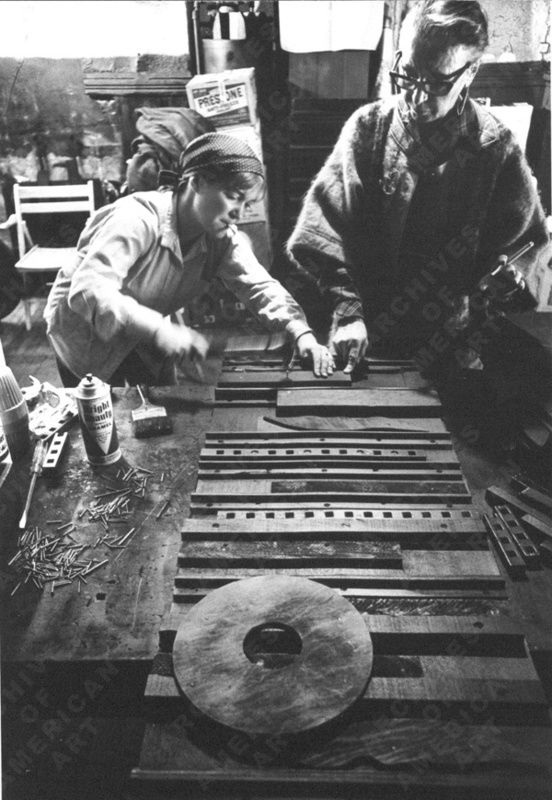 It’s around this moment that Nevelson, who lived until 1988, had her greatest fame, and most public commissions. It’s commendable that she kept pushing herself into new territory, that she tried on the spare rigid geometry of minimalism. But I’d take the solemn mysteries of her late 1950s work any day. “The Sculpture of Louise Nevelson: Constructing a Legend,” Jewish Museum, New York, May 5 to Sept. 16, 2007. Nevelson interviewed in 1964 and again in 1972 for the Smithsonian’s Archives of American Art. A guide to the Smithsonian’s Nevelson papers. 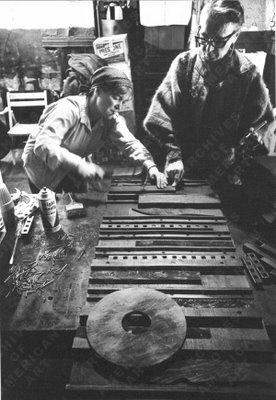 Pictured from top to bottom: Louise Nevelson at work with helper, circa 1965, photo by Ugo Mulas; Louise Nevelson appears fourth from the left with her classmates in 1913 image by an unidentified photographer; both these photos are from the Louise Nevelson papers at the Smithsonian’s Archives of American Art. 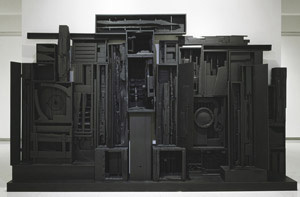 Then “Sky Cathedral Presence,” (1951-64) collection Walker Art Center, Minneapolis, © Estate of Louise Nevelson / Artists Rights Society (ARS), New York.